Clause (クラウゼ, Kurauze), or their full name Wilhelm von Clausewitz Halcyon HISUIMARU (ヴィルヘルム・フォン・クラウゼヴィッツ・ハルシオン・翡翠丸, Viruherumu fon Kurauzevittsu Harushion Hisuimaru), is a delusional, yet powerful human originally from the Outside World who nobody likes due to them being a nuisance. Because they are considered an annoyance on a frequent basis, they could be treated as a joke character. They are currently working for Garaiya Ogata. Not all that much is known about Clause. They are a very weird and eccentric person who somehow gained a lot of power because of their delusions. They are on a very frequent basis regarded as an annoyance, even by JynX, making them sort of a joke character. They are the final boss of Evanescent Existence, the first game of the Len'en Project, as well as a possible final boss in Brilliant Pagoda or Haze Castle. 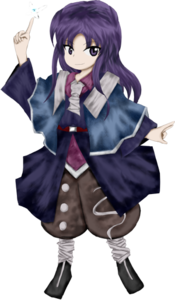 Despite their species being labelled as "annoyance", they are still thought to be human, who is originally from the Outside World, but was taken into Mugenri by Tsurubami Senri. Clause was a candidate to take the role as a shinto priest at the Senri Shrine, but they did not succeed in defeating Tsurubami. Because of Tsurubami's limitation on barrier control, they were not able to leave Mugenri, and thus overtime became a homeless wanderer on the verge of death. Some time before Brilliant Pagoda or Haze Castle however, they were picked up by Garaiya Ogata and was settled in at the Dragonfly Castle working for them. Not much is known about their reputation in the Outside World. However, Their sudden disappearance to Mugenri along with the rest of the Evanescent Existence cast is known to have made a huge news story in the Outside World. Clause is described to be arrogant, impulsive and an eccentric person. Their eccentricity got more wild upon entering Mugenri, and they talk on and on even though their knowledge is all superficial. However, most people treat them as an annoyance and hate Clause upon the first meeting. Yabusame Houlen and Tsubakura Enraku outright dislikes them and tries avoid them due to being an annoyance. Tsurubami Senri, Shion and Tenkai Zuifeng are some characters who instantly dislike them upon first meeting; their species is even labelled as "annoyance". Tsubakura calls it a "valuable talent", and Clause has come to describing themself as "heretical". They make quite long speeches in their dialogue and they often use metaphors and quotation marks on some keywords. The words used in quotations can be ambiguous in meaning, so it is really troublesome for everyone to fully understand them. They are really troublesome (or, a nuisance) in a multitude of ways. Most of their pseudo-philosophical ramblings have weird logic and refuse to listen to other's advice. Even if one tries to insult Clause, they will take it as a compliment and insist that they are superior to everyone else. Clause even recognises that conversing with them is difficult. Tsurubami's good ending in Evanescent Existence is the only time where Clause speaks normally, as well as having a sense of loneliness. Clause can control gravity and manipulate it at will on how they like, to an extent. They did not have this ability, or any other ability, when they were in the Outside World, but they acquired this ability upon arriving in Mugenri, eventually gaining a lot of power. It is because of their delusions that they have gained such great power, which is considered a total nuisance. They can create black holes that can focus, grow, and decrease the gravity around an entire field. They can also force their opponent towards a certain direction, but only to a small extent. However, because they have acquired this ability only recently, they do not seem to be great at using it. In Evanescent Existence, they talk on how great their power is to fake Tsubakura to the point that they could destroy the Sun that Casts a Shadow, since they believe they will gain power from it. However, they admitted to Yabusame Houlen that "it is indeed a law of the world's providence that something so 'indomitable' and 'bizarre' would take a bit of time to properly master." They even talk about their power being "heretical" in Brilliant Pagoda or Haze Castle. JynX admitted that Clause's ability is the most useless ability in the Len'en Project, because on how they put it, "it's just, like, so annoying." Their real name is unknown, but they go by the bizarre fake name Wilhelm von Clausewitz Halcyon HISUIMARU (ヴィルヘルム・フォン・クラウゼヴィッツ・ハルシオン・翡翠丸); Clause (クラウゼ, Kurauze) is a short-form used by various characters such as Yabusame Houlen and Tsubakura Enraku. Their name was described to be "so long it is hopeless to try to remember it" and that nobody actually cares whether their name is fake or not. In-game, their name would appear as "(Omitted Start) Clause (Omitted End)" (（前略）クラウゼ（後略）, (Zenryaku) Kurauze (Kōryaku)), and as of Brilliant Pagoda or Haze Castle, the English translation was labelled "(Zenryaku)", meaning "Omitted". JynX does not regret giving Clause a long name because they have hinted that there is special meaning to the name. They created a poll on Twitter to revealing some information about the Len'en Project, with one option having Clause's real name revealed. However, it was not voted for. Nevertheless, Wilhelm von Clausewitz is all German, where the Wilhelm is a ancestor of English William and von means "of" or "from". Halcyon is a type of bird, and it can be used as an actual name, although it may have Greek origins. In HISUIMARU (翡翠丸, official romaji), the first two kanji literally mean "jade" (翡翠, hisui), meaning the color green or a type of gem. It can also mean "Kingfisher", another type of bird (bizarrely, even the kanji as single characters can also mean "kingfisher", as well as "jade" and "green" respectively). The kanji 丸 means "full" or "round", or even "-ship" if treated as a suffix. The middle dots (・) in their name are used in foreign names to show where the next word begins. 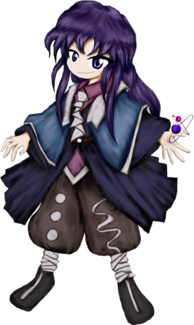 Clause has long purple hair and purple eyes. They wear brown baggy pants and a purple trench coat with a blue capelet. Their shirt is purple with a white necktie and they have bandages on their ankles. In their Brilliant Pagoda or Haze Castle appearance, they are holding a pink and purple neutron or atomic model. Clause is the final boss, and the Extra stage midboss, of Evanescent Existence. The priest Tsurubami Senri spirited away Tsubakura Enraku, Aoji Shitodo, Hooaka Shitodo, Kuroji Shitodo, Kurohebi, as well as Clause to the land of Mugenri, placing them in different airspaces to train their newfound abilities. Clause was the first to find a way to escape, arriving to the "sun that casts a shadow", which is a portal to the Senri Shrine. Clause believes the black sun to be a star and that they will gain power from it. The priest Tsurubami Senri, disguised as Tsubakura Enraku, travelled across various airspaces to test the outsider's abilities. Disappointed with most of the opponents, they ended up deciding on going to a portal connected to their shrine, which appeared to everyone else as a "sun that casts a shadow". However, Clause has reached it first, where Tsurubami find them an annoyance immediately. Whilst speaking long-windedly, Clause somehow came to the conclusion that they were the "chosen ones". Still thinking they were talking to Tsubakura, Clause wanted to test their powers with a danmaku battle and to "break the curse of the star". They also stated that they would go easy. However, Tsurubami ignored Clause's strange way of talking and metaphors, and proceeded to fight them. Clause casts five different spell cards, but was eventually defeated. After that in the good ending, Clause wondered where "Tsubakura" got their power from, to which Tsurubami revealed that they disguised themself as Tsubakura. Clause was the first to realise that this Tsubakura was fake, and they praised themself, claiming that they knew all along that they were not fighting with the real Tsubakura. They had a triumphant look on their tattered face, and they called Tsurubami a "monster". For the most part however, a clearly annoyed Tsurubami ignored them whilst doing their own thing – all while Clause was muttering to themself – and they left for the star. Clause then had a sense of loneliness. A while after being defeated by Tsurubami, Clause ended up encountering Yabusame Houlen in the same location. Yabusame did not want to talk to Clause, but Clause ended up rambling about their ability, trying to explain to Yabusame why they lost to "Tsubakura". They insisted that they were not really trying with their full power. Annoyed with Clause's strange words and metaphors, Yabusame and Clause settled it on a danmaku battle. Clause cast the same five set of spell cards, but they were defeated again. In the good ending, Clause could be seem lying defeated in the distance as Yabusame make their way across the black sun. Clause returned in the Extra Stage for one final battle on the Shrine Road to the Senri Shrine. They started with meeting the real Tsubakura, thanking them for their "help" at an earlier point, stating that they have to pay back something they "owe" to Clause. However, Tsubakura told them not to bother and to "go back to the hospital", leading to Clause to cast three spell cards for only to be defeated again. A while after, they meet Yabusame again, talking about not being an "adult" to meet an end in an unsightly way. Yabusame jokes with them until Clause makes them get "serious", casting the same three spell cards, only to get defeated again. After a few years of absence, Clause returns as one of the eight final bosses on the Neutral route of Brilliant Pagoda or Haze Castle. They were first revealed to be in the game from a Twitter post on 13 February 2016, months before the game's full release. In order to encounter them, the player must reach stage 6:-4, meaning that they have to take the Haze route for most of the game. They could also be encountered randomly on stage 6:0 if Suzumi Kuzu hasn't been unlocked yet, as well as stages 6:-2, 6:-3, 6:1, 6:2 and 6:3. After Evanescent Existence, Clause became a homeless wanderer. While on the verge of death, they were picked up by Garaiya Ogata. Clause ended up working for them and are therefore sided with the Dragonfly Army. In every scenario, they present a picture of Taira no Fumikado, asking if they have been seen anywhere (even asking Fumikado themself). This is because they have been tasked to retrieve them, either by Garaiya or Chouki. The protagonists say they have seen Fumikado (likely referencing their encounter on Stage 5), but they do not know where they are. This eventually leads to a battle because Clause does not believe them. Clause has trouble getting a good reputation with most people they encounter. Thus far, all characters that have met Clause have found them to be an annoyance upon first meeting. It is shown that Clause had ties from the Outside World with Yabusame and Tsubakura as they are acquaintances, but not much is known in detail. During Tsubakura's Evanescent Existence Extra, Clause says to them, "I must thank you for your help earlier... I'll have you pay back what you 'owe' me now." This was in reference to the Outside World and not Tsubakura's route because Clause was aware that the Tsubakura in the main route was someone disguised as them. Yabusame despises Clause even more than Suzumi Kuzu and treats them with contempt because of their habit of being long-winded and a general nuisance. Garaiya saved and adopted Clause when the latter became a homeless wanderer. In exchange, Clause now works for them. Apparently they get along perfectly, since both have annoying personalities (while Clause is long-winded and eccentric, Garaiya is obsessed with heroes). While not confirmed, when asked about Clause's relationship with Tenkai, JynX dodged the question, implying a relationship between the two. BPoHC Teaser image of Clause from a Twitter post. Most spell cards involve some form of gravity effect, akin to their ability. Some of them forces the player to move in a certain direction. A few of them involves a lot of knifes. Some of their spell cards are similar to those of Suika Ibuki . Both can control density and create black holes. Clause's species is referred as "annoyance", but is still believed to be human, because as shown in the Extra Stage of Evanescent Existence, Clause needs to go to the hospital to heal wounds. Their name might be the main reason to the layout changing on the practice menu from the trial to the full version of Brilliant Pagoda or Haze Castle. Two screenshots on twitter shows JynX struggling on fitting their full name within the window during development, to which on the full version has the layout change, having their full name fit perfectly. Despite being a final boss, Clause has a "defeated" portrait. This is something which is unusual to have amongst the Len'en Project and, at the time of Evanescent Existence's release, the Touhou Project . Additionally, the defeated portrait is different depending on whether the player is playing as Yabusame Houlen or Tsubakura Enraku. JynX was asked about Clause's whereabouts due to lack of appearances in the first interview, some time before the full version of Brilliant Pagoda or Haze Castle. Clause was originally planned to be a playable character in Earthen Miraculous Sword, as JynX revealed in a tweet after they dug up some old dialogue they had written up. ↑ JynX's Twitter: "I found stuff like dialogue data of Clause being a playable character in EMS... How dreadful."